Eye shadows are my second favorite thing in makeup after Lipsticks. And so I keep buying eyeshadows when I am not buying any lipsticks...lot. So today I am going to share my experience with Colourpop Fem Rosa collection. The collection launched last year (2017) which consists of two beautiful palettes. One is Fem Rosa She Pressed Powder Eye Shadow Palette and another is Fem Rosa Her Pressed powder Cheek Palette. 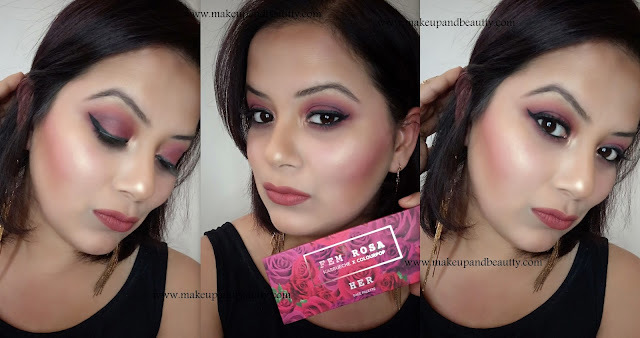 Fem Rosa, She Pressed Powder Eye Shadow Palette was priced $16, which I bought in Rs.1600/- from an Instagram stores. 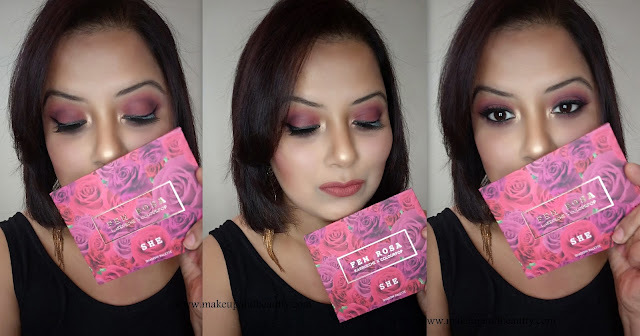 Fem Rosa Her Pressed powder Cheek Palette was priced $15, which I bought in Rs.1450/- from the same Instagram seller (not mentioning her page name as I guess she stops her business). Both the palette can be given 10/10 just for the packaging. Both come in a beautiful packaging of pink carton box. The palette itself comes in beautiful pink and red roses combination hard box. Both the palette has a magnetic closure. All the name of the eyeshadows are written at the back of the carton box and at the back of the palette too. Both the palette has no mirror in it. And both the palette has very sleek packaging and they are very lightweight. So both are the travel-friendly palette. The very first time I saw the palette I love it. Not because it has some awesome shades which I don't have in my stash but it is all because of packaging that I grabbed it. Now the Colourpop brand has some awesome eyeshadows quality. I have few pressed single eyeshadows too before so I was pretty sure about the eyeshadow quality of this palette. And yes, this palette stand out my expectation too. The palette is basically a warm based palette with mostly pinks, peach, plum, coral and copper shades which are just perfect to create any kind of look. The eyeshadows are buttery in texture and they blend super easily on eyelids. The eyeshadows stay forever on eyelids until you remove it. They have very minimal fallouts. And these eyeshadows don't crease on crease line too. Overall I love the palette and I wish I could recommend it to all but it is now oos in Colourpop Website. Lately, the concept of having one bronzer, one blush and one highlighter is found in many brands. And this concept actually very handy when you are traveling or in hurry. 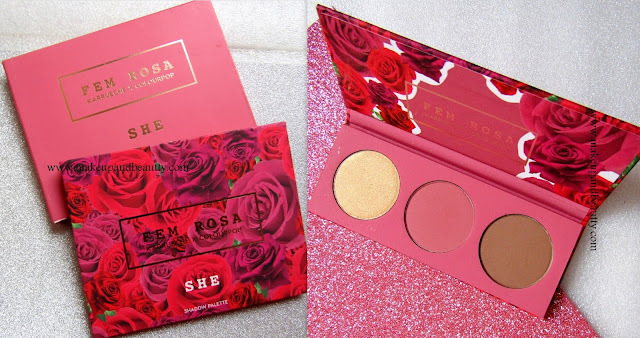 So it was started with Sugar cosmetics Contour De force palette (reviewed here) that my second purchase was this Fem Rosa Her Pressed powder Cheek Palette. The palette has a bronzer, a highlighter and a matte pink blush which is just perfect for fair to medium skin tone beauties. The pigmentation of all bronzer, blush, and highlighter are awesome. One swipe and you can see the color. One should use the bronzer light handed as it is that much pigmented. The blush is a beautiful matte pink and super pigmented. 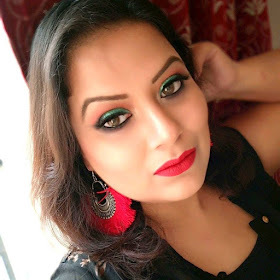 The highlighter is a beautiful golden sheen kind of highlighter and it can be used as blinding highlighter for party makeup or very light handed too for any day look. Overall I am just loving this palette and happy that I grabbed both before they gone. Both the palette according to my opinion is awesome in every way. The packaging, pigmentation, quality of the shades everything is damn good. But now as it is oos and if you feel like buying it then let me tell you honestly that the eyeshadows in that palette are pretty dupeable and the cheek palette is dupeable too (many drugstore brands have this kind of palette now) so you can check in other brands too. i also have fem rosa palette and its amazing. I like this face palette as well.